William T. Doyle, a founding faculty member of UC Santa Cruz, traces the campus's early history in "UC Santa Cruz: 1960-1991." William T. Doyle, a founding faculty member of UC Santa Cruz when the campus opened in 1965, has written a book that traces the early history of the campus. UC Santa Cruz: 1960-1991 begins with the story of how the campus came to be located in Santa Cruz and describes the challenges of designing and building the new campus. 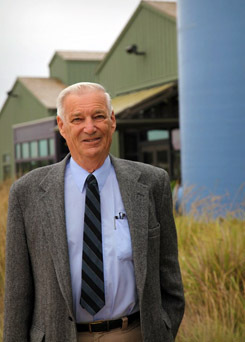 Doyle, a professor emeritus of biology, held many important administrative positions during his years at UCSC. He is best known for his leadership in the planning and development of the marine science program at UCSC, and several chapters of the book are devoted to those efforts. 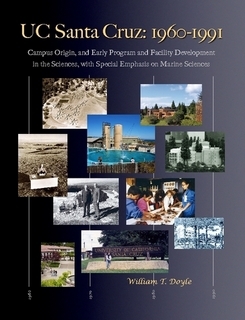 In a foreword to the book, Chancellor George Blumenthal wrote that Doyle "was indeed a pioneer, who arrived at a nascent campus with almost no buildings, no academic programs, and very few faculty. His own commitment to the campus led to a string of developments and contributions that spanned his entire career." By the time he retired in 1991, Doyle had served as chair of biology (twice), dean of the Division of Natural Sciences, a founding faculty member and deputy and acting provost of Oakes College, and director of the Institute of Marine Sciences. Meticulously researched, and illustrated with more than 80 photographs, Doyle's book describes some of the key people and events that shaped the overall development of the campus. Doyle said he was urged to write the book by faculty, staff, students, and community members who knew of his role in establishing many of the campus's premier science programs and facilities. No comparable history of UC Santa Cruz has been written, and Doyle said he wanted to correct some of the inaccuracies that have appeared in other publications about the campus. "Some of the oral histories contain incorrect information, which is to be expected from people's recollections of events that happened many years ago. But I didn't want that to be the only published record of the campus's early history," Doyle said. In the book's introduction, he cites the Cowell College motto, "Pursuit of Truth in the Company of Friends," which for him served as a motto for the entire campus. Doyle's continued devotion to the campus he helped launch shines through in every chapter of this informative book. The book is available at www.lulu.com. Royalties will be donated to the Friends of Long Marine Lab to support research and education on coastal and marine issues.